Two things before we get started. First, this blog has totally been a literary blog lately and for that I apologize. Not because I think literary blogs are cause for apology, but because posts about writing and books is not what one would expect from a blog entitled “Tattooed Missionary.” I’m sure eventually I’ll write more about missions and the Bible and stuff. Just hold on! Second, this post is a total spoiler. However, since the book was published in 1975 and the movie was released in 2002, I think any spoiler alert restrictions have expired. I’m going to start off by saying something you rarely read/hear. In the case of Tuck Everlasting, I like the movie better than the book. It’s true! In my opinion the book’s alright and the movie makes me cry like a baby. Tuck Everlasting (book and movie alike) tell the story of the Tuck family, comprised of Mae and Angus and their sons Jesse and Miles. The Tucks once drank from a magical spring in an ordinary wood and now they can never die. When we meet the Tucks, they’ve each been alive for over one hundred years. Which is a lot of years. Winifred Foster is a privileged, stifled, bored girl of 15 who (in the movie) has just been informed by her strict parents that she will be shipped off to school to learn to be a lady. Well, that was the straw that broke the rich girl’s back because she took off! Into the woods that surround her house. (In the book, young Winnie – who is only 10 or 11 – had been thinking about running away for a while and one day decides to try it just for a day.) In the woods, Winnie stumbles upon Jesse Tuck drinking from the stream equivalent of the sorcerer’s stone. Things get crazy when Winifred declares that she would like a drink from the stream. Knowing what the stream does to people, Jesse Tuck can’t let that happen, and so he (and his mother, in the book) take her to their home. Technically, she’s kidnapped. After some time (a day or two in the book, weeks? in the movie) Winnie learns to love the Tucks and to learn of their secret. She also learns how to live life and love nature. But, all good things must come to an end, and when the creepy guy in the yellow suit tracking the Tucks for their magic immortality water finally finds them, stuff goes downhill quickly. Creepy suit guy threatens Winnie so Mama Mae kills him. Winnie is returned to her parents and Mae is sentenced to death. Only one problem! She can’t die! So Winnie and the Tucks have to spring her so that nobody finds out the truth about their can’t-die family. Then the Tucks leave – but not before the eternally seventeen-year-old Jesse Tuck can propose to Winnie that she drink the water and wait for him to come back for her so that they can travel the world together. (Which is cute when she’s movie-fifteen-years-old, but kind of odd when she’s book-ten-years-old). Movie Winnie is an age-appropriate love interest for Jesse. In the book Winnie is ten and Jesse is seventeen. Jesse proposes that Winnie wait until she is seventeen to drink the water so that they can get married. In the movie Winnie is fifteen and she and Jesse fall in love. He proposes she drink the water right then so that they can travel the world together. Much more adorable and much less creepy. Movie Winnie stays with the Tucks for more than a day. Babbitt has Winnie with the Tucks for one day. In that one day she fears them, trusts them, questions their sanity, and loves them. That’s a lot of emotion packed into one day. Also, I’m no expert (although I have watched a lot of Criminal Minds) and even though the Tucks were not especially cruel kidnappers, they still kidnapped her and I can’t imagine that a ten-year-old girl could grow to trust and care for her kidnappers so quickly. Lieber has Winnie stay with the Tucks for much longer (it’s not clear how long she is with them, but it seems like a couple of weeks) and also go with them much more willing. Her trust and love for the family make more sense within that time table and with that beginning. Miles is a stronger, angrier character. At first I wrote “grumpy Miles” down in the con column (yes, I was taking notes while watching the movie), but later I changed my mind. While it’s true that the eldest Tuck son is much grumpier and cynical in the movie than he is in the book, his sadness clearly shows the burdens that can come with being unable to change, grow, or die. Jesse loves life and sees his immortality as a gift, a gift he doesn’t intend on wasting. Miles has experienced loss because of his immortality and sees his condition as more of a curse. In Miles’ movie-telling of the Tuck’s story, his feelings are much clearer. Miles tells Winnie how his wife, after realizing he couldn’t die, left him and took the kids. He tells how she later died in an insane asylum. In the movies Miles also mentions having been in wars. He doesn’t feel that he deserves to live while so many he has cared about have died. With her novel, Babbitt opens the reader’s mind to the idea of immortality. With his screenplay, Liebel explores the concept further, showing us Jesse’s acceptance of his gift and Miles’ burden of his curse. The ending is much more dramatic. By saving the “big reveal” (that the Tucks can’t die) for the end of the movie, Liebel sets up a more dramatic wrap-up. The ending starts by Miles telling their story. It all starts to come together. Winnie gets to have her chat with wise ol’ Tuck before the creepy suit guy shows up. Then Mae gets thrown in jail and instead of having Miles take off the window in the night and Winnie pose as Mae until the morning, Liebel has Jesse and Miles distract the jailer in a dramatic thunderstorm with swords and capes! It’s much more dramatic and has the same result – Mae gets free. Winnie’s relationship with her family is changed for the better because of her time spent with the Tucks. The book closes on a child Winnie giving the magic spring water to her toad-friend. The epilogue includes Mae and Tuck finding Winnie’s grave. She died at an old age. The movie closes with Winnie’s grandmother dying. Which might sound like a bummer of a way to end a movie and a bummer of an event to add in to a story. However, watching her mother deal with the grief of losing her mother not only adds a level of humanity to her parents that Winnie had scarcely seen before, but also adds even more to the discussion of life and death. The movie epilogue is Jesse (on his motorcycle) finding Winnie’s grave. It’s so much more moving to have her lover find her grave than her month-long-surrogate parents. In the movie, when Miles is telling Winnie how the Tucks found out about the spring and their condition, the flashback to Jesse falling out of the tree is so creepy. Sometimes when I close my eyes at night I can see him falling out of that tree all scary and not-able-to-die-y. Babbitt could’ve ended the movie with the typical “happy ending” and the leading lady forsaking all for her love. But she doesn’t. Winnie doesn’t drink the water. She doesn’t choose years of waiting to start an eternity with Jesse. She takes what she’s learned from the Tucks and applies the lessons of life and love and loss to a full, happy life. The creepy yellow suit guy, in the movie, mentions that the Tucks have been hiding out for over a century. In both the movie and the book Jesse says he is 104 years old. If he hasn’t changed since he was seventeen, and let’s say they didn’t find out about their immortality for a few years afterwards (enough years for the horse to get shot and Jesse to fall out of the tree and Miles to get married), then they’ve only been hiding out for 80 years at the most. Which is not enough for a century. When movie Jesse is riding away on the back of his family’s carriage in the rain and he says, “Winnie Foster, I will love you until the day I die!” I cry every. single. time. Liebel adds in a classic quote* to Tuck’s talk with Winnie. Winnie confesses that she doesn’t want to die and then asks if that’s wrong. Tuck responds, “Don’t be afraid of death, Winnie. Be afraid of an unlived life.” The narrator during the epilogue adds, “You don’t have to live forever, you just have to live.” Inspiring. You can read Tuck Everlasting by Natalie Babbitt here. 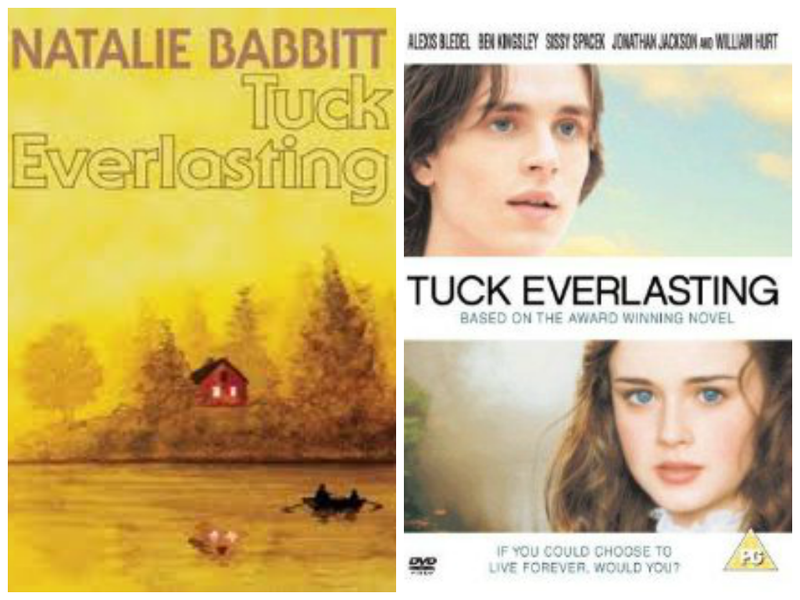 You can watch Tuck Everlasting here. *Many sources attribute this quote to Natalie Babbitt’s novel, and it’s possible I’m missing it, but I can’t find it in there. Are there any movies you have enjoyed more than their novel counterparts? More importantly, and more tragically, are there any movies that just botched your favorite book?